The web has become reactive. Web applications are being packed with more API calls and are consuming more third-party data than ever before. Frameworks and patterns are evolving to satisfy the increased complexity. Data needs are shifting, and managing data in the global state just won’t cut it anymore. Okay, so you’ve moved on long ago from storing data on the browser’s global window object. That’s a good start, but we can do better. Do your web components query for data changes, or do they react to data changes? The difference is a pull vs push-based approach, traditional vs modern, imperative vs reactive… you get the picture. The solution to controlling and scaling your front-end data is in utilizing reactive data stores. In Angular, components consume data and services produce it. Components should be decoupled. They shouldn’t depend on each other, but they often depend on the same data. For instance, if Component A and Component B need data from Service C, then each component must query the service. There are two downsides to this approach. First, if the service is providing remote data, then it will make duplicate API calls, one for each invocation. Second, querying a service for data is a one-time request and components are unaware of future changes. 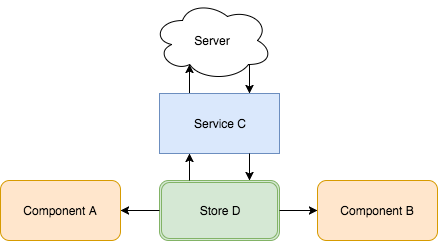 Reactive stores fill this void by acting as local push-based caches between the components and the services. In this scenario, Component A and Component B subscribe to Store D for data. Store D then uses Service C to load data and the components are left blissfully unaware to how the data is actually fulfilled. Push-based data stream. Components are always provided the latest data. Lazy-loading. Data is loaded on first use. No duplicate HTTP requests. The store takes control of making HTTP requests. Stores wrap the service that components would otherwise be using to directly load data. In the previous example, the store was loaded on its first invocation. Since stores are just a pattern, you can implement your own way to load a store, either manually (explicitly call a method from your component) or automatically (lazily on first subscription). Actions can (and should) manipulate the store state. In fact, any action, such as an edit or deletion, should be handled through the store. This way, the store handles the propagation of change back to its subscribers. Stores can be scoped using Angular's hierarchical dependency injection. Scope is important, and it varies by use case, but the idea is that a store is only relevant to a specific group of components for a specific period of time. Stores don't necessarily need to persist globally throughout an entire application. For example, a CustomerStore can be scoped to the CustomerPageComponent by marking it as a provider to that component. A store scoped in this way also makes the CustomerStore available to all child components of CustomerPageComponent. This ensures that when the CustomerPageComponent is destroyed then so is the CustomerStore along with its data. The lifespan of a store is usually longer than the components that use them. Components are constantly destroyed and created during application use. The subscriptions that these components create will continue to live on and cause a memory leak unless they are cleaned up. Luckily, there is a simple convention for handling subscription cleanup. We can make use of the component's ngOnDestroy lifecycle hook and RxJs's takeWhile operator. Stores are just another tool in the toolbox. They shine in large applications, but also have practical use cases in smaller ones too. Hopefully you'll find a lot of benefit in using them in your next or current web application. If you have any questions, please feel free to comment or drop me a line at jstrickler@ipponusa.com.